This magnificent apartment is tucked away in the bustling neighborhood of Marx Dormoy, an area which is a mixture of interesting influences: rural French with its covered Marché aux Olives, and ethnic with Asian restaurants and supermarkets. Entering this apartment from the street is almost a jolt to the system. It is a magnificent modern loft space. This makes for a fascinating juxtaposition of top contemporary comfort and design nestled within a bustling multi-ethnic neighborhood, and at the doorstep of the metro and all conveniences! This unusual 132 m2 (about 1421 ft2) loft is really worth that extra short ride on the metro. Walking through the door, you are at once bathed in a sensation of space, quiet and comfort. The apartment was recently remodeled in 2011-2012. 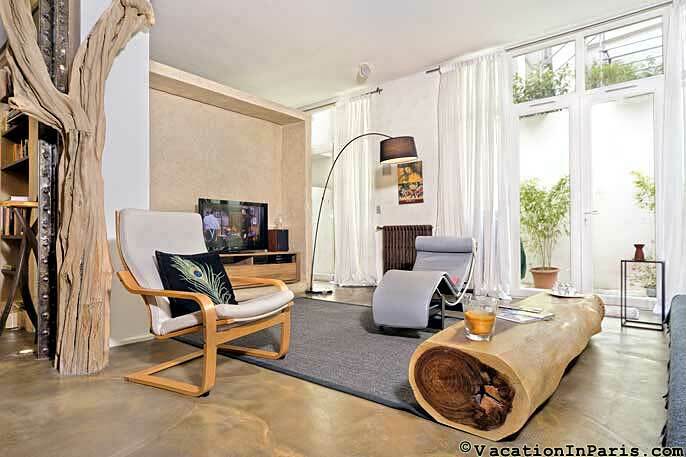 Designed in the original Eiffel style from the 1930's with metal beams, the look is clean and modern with varnished cement floors, natural rock walls, and two actual tree trunks. The views from the windows are either directly onto the neighboring church wall, or onto the terraces. From the street, one walks through the building and into the courtyard. The noise of the street disappears. Everything is white washed in this inner court, except for one wall which is the outer side of the church. Down a few steps, the loft opens up into a large and breathtaking open space (49 m2). It is divided into the entryway, the living room/dining area and kitchen. 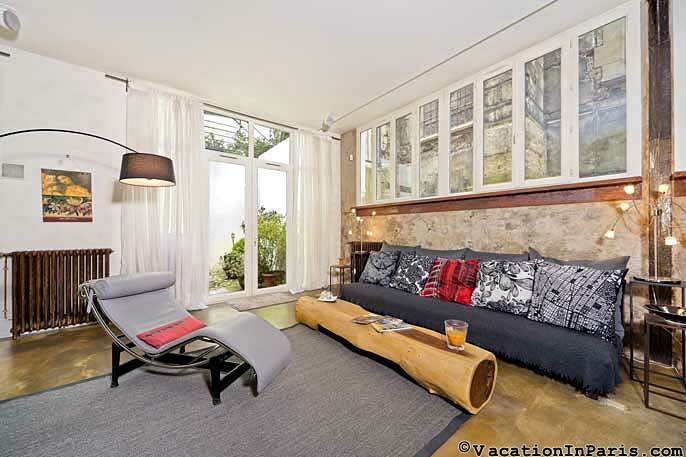 The living room, which gives onto a private 35 m2 terrace, features a gray leather Corbusier lounger designed in 1920 as well as two comfortable chairs and a very long couch which can seat 4 people. This long couch can also sleep a 5th guest. Facing the sofa, beyond the tree trunk coffee table, is a 42” TV, DVD system, and stereo system with a wide selection of CD's to choose from. There are ceiling speakers in most of the rooms, so that you can enjoy your choice of CD's even while you’re relaxing in the extra large bath! The adjoining dining area has a long rectangular steel table which can seat 8 comfortably. Nearby, the galley style kitchen is a chef’s dream! 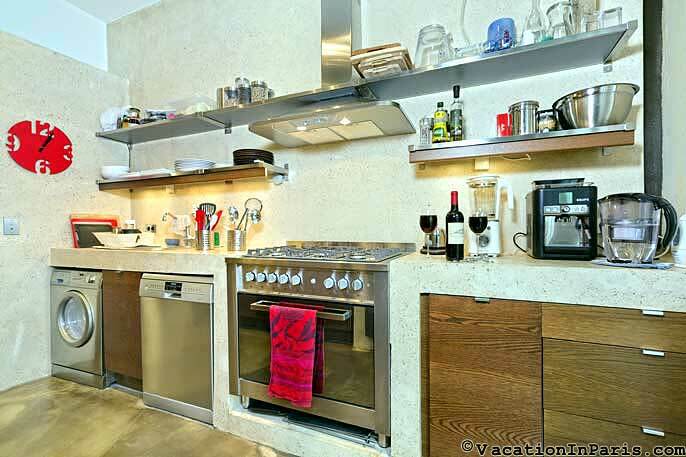 With counter tops made of varnished cement, the space is open and modern, with a top notch stove top with 5 gas burners, a large size self cleaning oven, a huge refrigerator and freezer, dishwasher, microwave, and plenty of appliances and utensils. This is also where the clothes washer/dryer is located. You’ll find an ample supply of dishes and kitchenware for your use. The kitchen and living room both open onto the terrace. Down the hallway from the entryway is the guest room with adjoining bathroom. 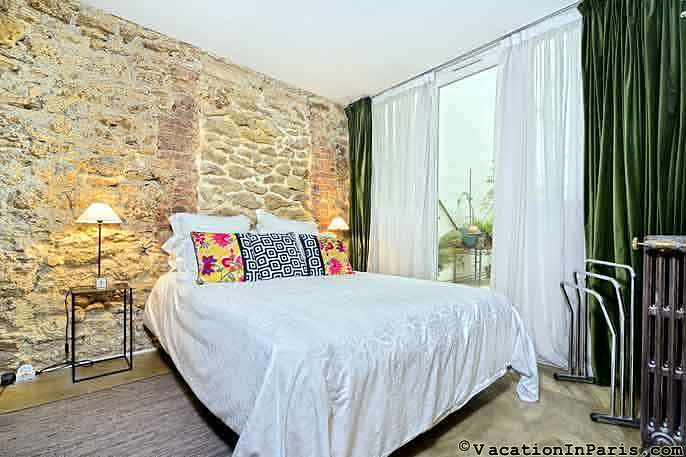 The bedroom, with a queen bed, has a natural rock wall on one side and opens up onto a semi-private terrace. There is ample storage space to make you feel at home. 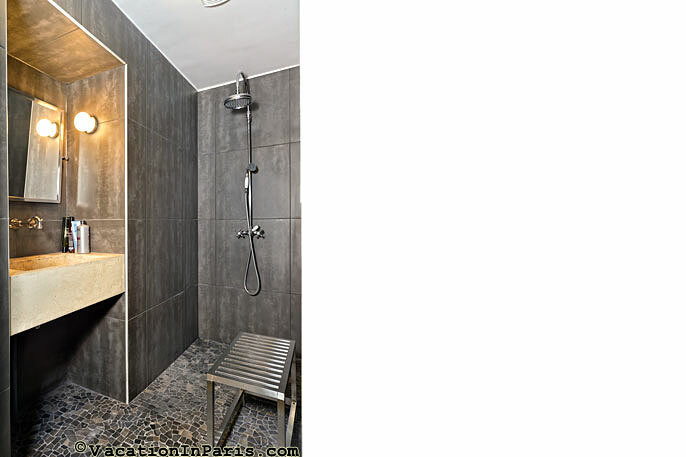 The newly remodeled adjoining bathroom has a walk-in rain shower as well as hand held shower. The square shaped sink is made of cement. Around the corner just into the hallway is the separate WC with sink. Across the hall and past a walk-in closet, you go three steps up to the spacious master bedroom. 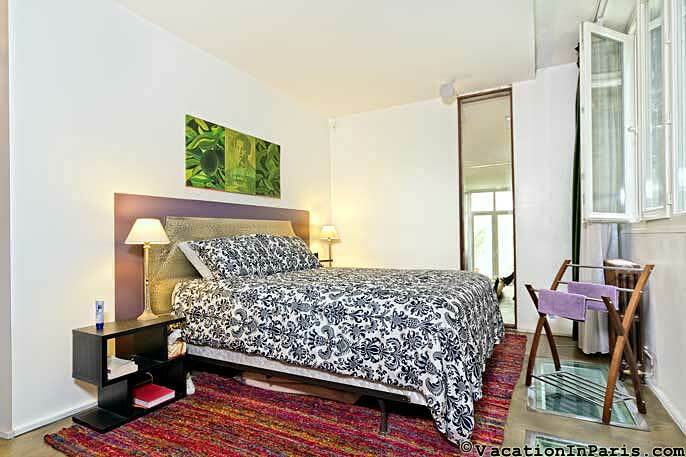 The queen size bed looks onto the side of the church, and one wall has a tall vertical glass window overlooking the dining/living area. The en-suite bathroom is one step down and features an extra large bathtub with claw feet and with hand held shower. The bathtub is long and deep; 25” wide, 68” long and 23” deep. It can fit two very tall people at once! 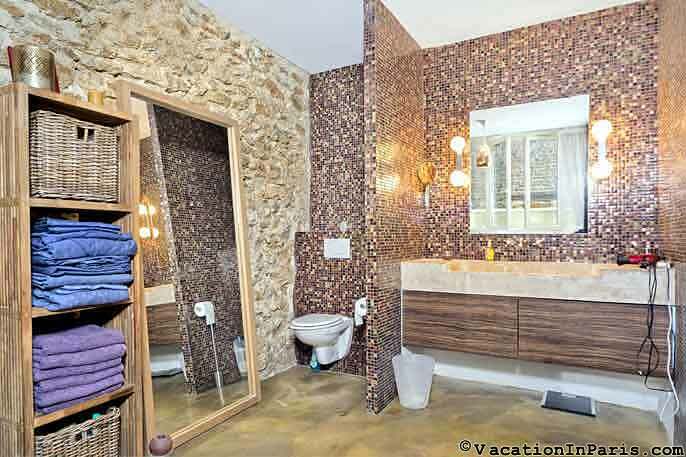 One of the bathroom walls is of stone and rocks, and the windows, like the bedroom, give onto the wall of the church. Put on a little music, and thanks to the ceiling speakers in the master bedroom and bathroom, this makes for a fabulous way to finish the day! Whereas in some Parisian apartments there is a problem with enough hot water, here there is instant hot water at all times. This apartment has individual gas heat, so you will not be cold on those cool Fall evenings. This loft is perfect for hosting and extremely convenient. Just around the corner from the apartment is the Marché aux Olives, an indoor marketplace, which runs along the rue d’Olive. You’ll find all types of fruit, vegetable, and cheese shops as well as butchers, fish monger, bakeries, and delicatessen style vendors. So easy to bring it all back to enjoy in this paradisaical loft. Nearby you’ll also find supermarkets Franprix and Monoprix as well as several Thai and Chinese supermarkets, and a selection of restaurants and cafés. 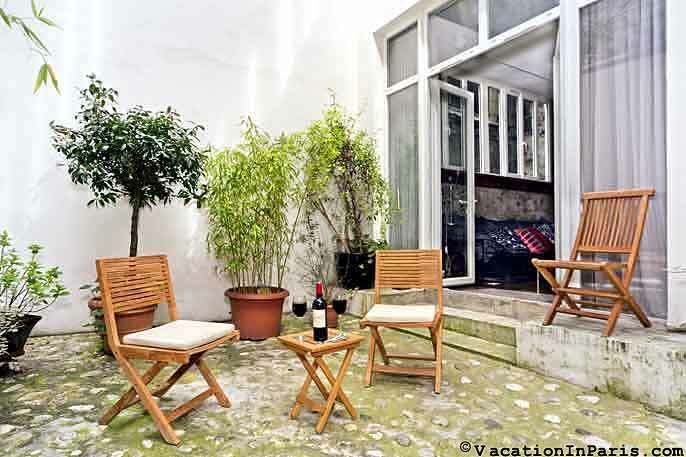 The apartment is a great choice for those who want total comfort and space within a less touristy part of Paris. Yet you’re only minutes from the sites of central Paris. The metro stop Marx Dormoy on line 12 is only a one minute walk from the apartment and only 12 minutes to the Madeleine stop on the same line. 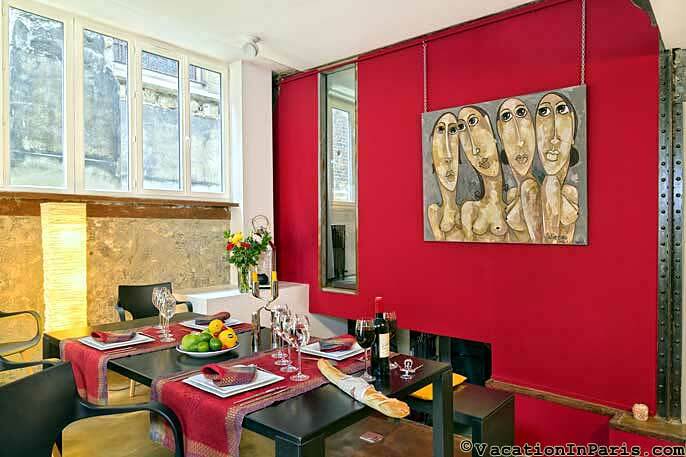 This convenient metro line traverses all of Paris from North to South, taking you directly to Montmartre, or Montparnasse and with an easy connection to Chatelet and Notre Dame. 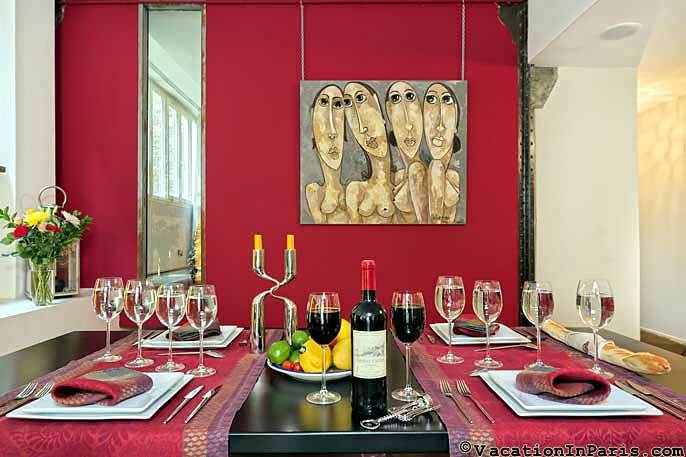 The owner kindly requests that there are no guests under the age of 24 yrs unless accompanied by parents. This apartment requires a “Meet and Greet” - guests will be met at the apartment and given keys at that time.